Click to enlarge. For more Wordless Wednesday, click here. For more Whimsical Windows, Delirious Doors (WWDD), click here. Lovely! I really enjoy your doorway photos. the door looks very intriguing. It's amazing how the door still stands out even though it doesn't have a tremendous amount of contrast with the brick color surrounding it. Love how it blends but still makes a statement; nice shot. I love your photos of doors - I always wonder what is behind them? Merry Christmas, and a Happy WW! It looks like I need to go to Denmark just to admire the doors there! what an interestingly inviting door ..
You know how much I love doors, and this one is a beauty. The ironwork in the demilune window is fantastic! Even the door has many stylish details - the arched window above the door has the feeling of a spider walking on it. The diamonds inserted into the oval window are cool, the red color classic. Neat! I love the detail on the window above the door. Such a great photograph! Thanks for sharing it! Very special color for a door ! I love door and that is a great one. This is beautiful - it looks like several doors in one! You really should publish a book that is a collection of your photos of doors. They are endlessly fascinating, aren't they? That is really beautiful! Thanks so much for participating, the more the merrier! Wonderful. 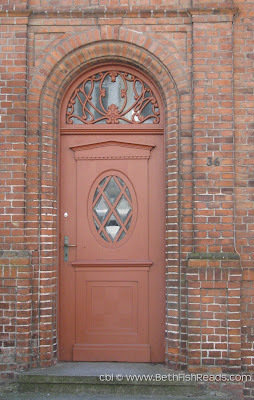 I love the iron work and how the color of the door complements the brick color. What a pretty door. It has a lot of character. Lovely! Is it Ribe or Copenhagen or what? I could live there. And I don't even care what the inside looks like (although I'm sure it's lovely). An interesting doorway. I like how it matches the bricks in color but contrasts in shape. That is a seriously cool door. Neat picture. Very warm entryway.